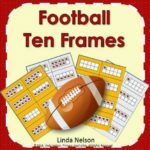 If you’re taking your class to the pumpkin patch, here’s a set of ten frame activities your kiddos will love! There are two levels, subitizing and operations, to accommodate abilities of kindergarten through second grade. For extra fun, your students will love to color by the code!